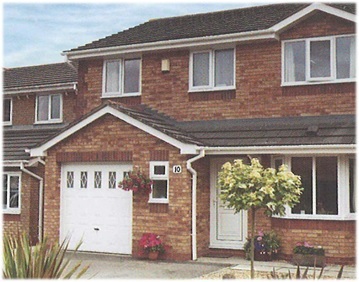 Up and Over Garage Doors are by far the most common type in the UK. They fall into two main categories for the types of operating mechanism - canopy or retractable. This is how the garage door panel opens and closes and both mechanisms have their uses in different applications. The canopy garage door is the simplest and most common type of up and over garage door mechanism. It gives the maximum drive-through width when open and is the easiest to install. The door is balanced and assisted by torsion springs positioned above the door panel on the head of the fixing frame. The retractable is the mechanism that will convert easily and safely into remote control electric operation with the least equipment required. The retractable mechanism can take much heavier loads with tension springs at the sides easily increased in size and strength if required. It is generally considered smoother and easier to operate.